It’s been quite the week around here, setting back in from camping, experiencing my first earthquake on Tuesday (oh so mild, but still a rather memorable first!) and now getting ready for Hurricane Irene. Glad we’re on the first floor and not terribly close to the water, but with a first-time-i’ve-ever-heard-of preemptive shutdown of the mass transit systems starting tomorrow noon, it’s making quite a ruckus. We’ll see if it comes as predicted, but we’re getting a few things taken care of just in case, it would be pretty head-in-the-sand not to pay some attention to it! Our front-room tenants are supposed to leave tomorrow, but given the situation it looks like they may be staying a few days longer :). Cousins plotting out their fort … I promised a trip recap, and though much of the feelings have faded (oh how fast that happens!) I’ll see what I can dredge up. It was a different trip than previous years, as Michael stayed home, and that changed a lot of things. I missed him more than I expected, though we’ve been apart for extented periods of time before. It was being on vacation, and not having a familiar routine to keep me busy that made it feel stronger. That, and the general stress level here has been pretty high in recent months, so I don’t have the same meager emotional reserves that I normally do. Grandpa relaxing with the no-so-little-anymore littlest cousin. I deliberately scheduled more time with my parents and siblings than usual, foregoing some friend visits in Chicago as a result. I missed seeing people, but felt a strong urge to spend as much time as I could with my family, and it was truly relationship-building time which I’m very thankful for. If your kids have a lot of cousins, you know how they tend to really click with one or two, and likely not so much with the others? At least that’s true for Douglas, and it’s hard to keep it so that when they’re all together, some aren’t left a bit on the sidelines. I made sure to plan some early one on one time that really helped tip the balance in the direction of a more even playing field when they were all together, and it worked! So glad for that, some relationships just need an extra nudge to get rolling. Perfect midwestern sunset … The camping was more relaxing than usual, and it wasn’t just the perfect weather. I think having done it so many times now it’s easier to get things put together, and my sister takes the helm of the whole food thing which means that the rest of us just follow directions and eat like kings. I always feel a bit guilty as we can’t bring food or gear when we fly, so that kicks my guilt complex into gear and I try to work a bit harder in the kitchen, or get my tent up without stopping for a breath. It’s crazy how certain behaviors haunt you, isn’t it? I fall right back into the speed/competitive thing that filled my teenage years … there are a few aspects to my childhood that bear some resemblance to the Cheaper by the Dozen book. We were only 3 kids, but efficiency was a very highly regarded characteristic, especially when travelling! Ever have to pee in a coffee can in the back row of a van, because no one else had to go yet and it wasn’t worth getting off the road to find a bathroom for?! Probably an extreme example, but yes it’s a trap I fall into often :). Fynn and his prize catfishThe highlight of the trip for Fynn happened on the Saturday of our camping trip. One cousin brought fishing gear, and my brother-in-law picked up a couple bamboo rods and some bait at WalMart when some of the other boys expressed interest in giving it a try. It was discovered that there was a kid’s fishing derby on Saturday, and Fynn and his cousin P decided to enter. They had 1.5 hours to fish anywhere in the park they wanted (we were on a big lake), and had to go weigh in at the visitor’s center with their catch at the appointed time. Fynn had only fished once in his life, the night before, catching a little 5 incher only to have it fall off the hook after he bonked it’s head on the rocks reeling it in. So Derby morning he got his bamboo pole (3x as long as he his, no reel, just a line and hook) rigged up with a lure, weight, and some stinkbait (think rancid peanut butter, left to ferment for a decade or two), tossed it in, and sat down to watch for the wiggle. Not 10 mintues later the pole bent over, and he had a fish! It put up a nice fight, so he had to scramble up the rocks with the pole over his shoulder, then follow the line back down to the water’s edge and get a grip on the weight to actually pull the fish to land. To shorten the story (you know fishermen and their stories …) he won his age group and the overall competition by a landslide, got him own rod and basket and a big enough gift certificate to fill a new tackle box too. He was one happy camper! 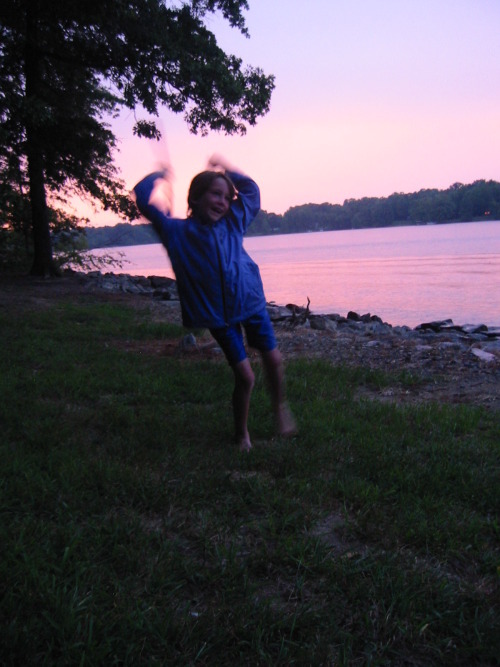 Dancing Douglas … Douglas had a fabulous time with cousins, had lots of freedom, and came home exhausted and satiated. Both boys were asking to come home a couple days early, which spoke to the lack of their Dad more than anything, they’ve never asked to do that before that I can remember. I was ready to come home to my husband, but honestly not to the city. I’ve shed a few tears every time I’ve come home in the last couple of years to be honest, wanting so badly to move but not being able to yet. I’ve slowly been realizing though that I just need to start doing some of the things here that I want to do when we move, and get the ball rolling. Be more hospitable, make more homemade things, be outside more, and make time for creativity. These things I can do no matter where I live, and I’m trying to keep them front and center so that they don’t get buried under the tidal wave of daily life. There are small victories here and there, and they’re all the sweeter for being tiny.